The lengthy process of administering assets that have uncertain recoveries, or that may require significant time to handle, often requires the establishment of a vehicle that can be separated from the insolvent company's business operations. 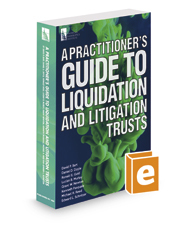 A Practitioner’s Guide to Liquidation and Litigation Trusts is designed to give bankruptcy and other professionals an overview of how and when trusts can be used to handle significant large-scale litigation matters and the liquidation of other assets for the purpose of accumulating recoveries and distributing them across multiple claimants. It offers guidance on the most common issues faced in establishing, managing, monitoring and ultimately concluding a liquidation trust or litigation trust. Convenient checklists, relevant case citations and references to bankruptcy-related issues, as well as recommended forms of trust agreements and suggested provisions for bankruptcy plans and disclosure statements are also provided, along with a comprehensive glossary and index. A Practitioner’s Guide to Liquidation and Litigation Trusts is an invaluable reference for lawyers, financial advisors and other professionals in the use of these trusts or other vehicles with similar structures and issues.